Walking horse trainer Larry Wheelon heads to court today in Blount County, Tennessee. The well-known trainer and judge will face charges following his arrest on Friday. As shown in this video from the Humane Society of the United States, horses placed with Wheelon for trained were seized by the USDA, with assistance from the county sheriff and humane society officials, in connection with the charges. Wheelon may be criminally charged for violations of the federal Horse Protection Act; soring is also a violation of state law in Tennessee. Further charges may be levied against Wheelon's employees or associates. The Horse Protection Act has been on the books since 1978 but attempts to enforce it have not been fully effective at wiping out the practice. As these videos point out, soring may be of the "chemical" type, which works on sensitizing the horse's pasterns and/or coronet, or "mechanical", which involves intentionally trimming the foot to thin the sole and lower the wall and then inserting objects or hard-curing epoxy between the padded shoe and the thin sole. 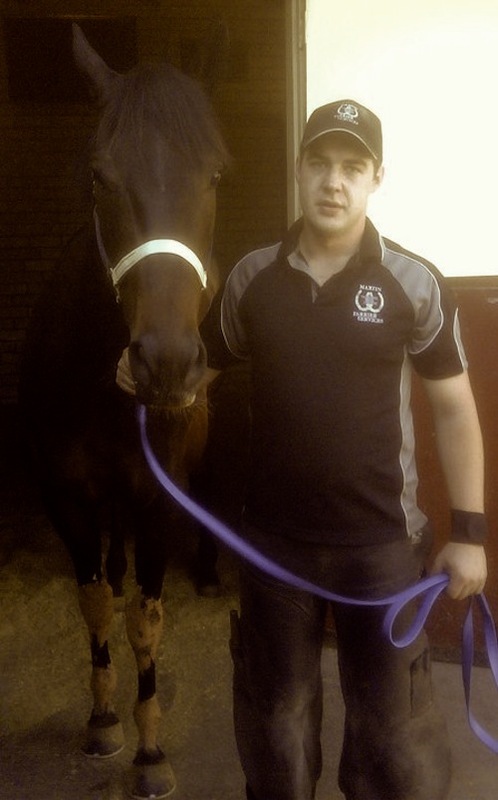 Australian farrier Matt Martin and the most famous mare in the world: Black Caviar. Photo courtesy of Abu Masum of J.C. Milton & Company, the supplier of the mare's raceplates. It's Kentucky Derby time in the USA, but Down Under in Australia, they won't even blink at the thought of twin spires, blankets of roses and mint juleps. The country can afford to have a been-there-done-that attitude toward horse racing. Their outstanding race mare Black Caviar has dominated news in the racing world for the past four years with her career-long unbeaten streak of 25 races. She even traveled all the way to Ascot in England to beat the British. 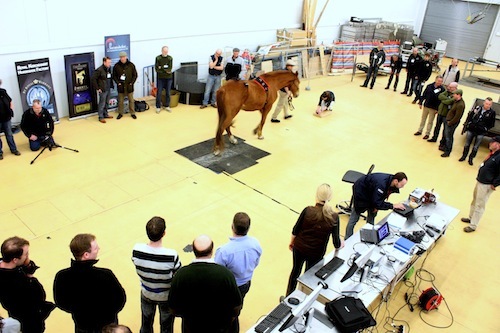 A small group of farriers with a keen shared interest in equine biomechanics and a thirst to understand the science behind horseshoeing had a unique opportunity to witness an afternoon’s research conducted in the Royal Veterinary College’s Structure and Motion Laboratory in England last week. The RVC’s Renate Weller DrMedVet, PhD, MRCVS, FHEA led the event, along with her team, which represents a range of scientific disciplines. Lieutenant Jonathan Boniface, US Cavalry, used this shoeboard as an illustration in his book, The Cavalry Horse and Its Pack, in 1903. 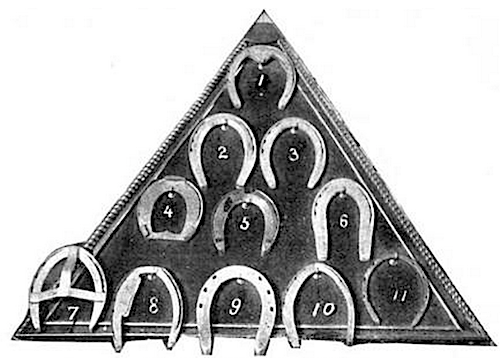 The shoes shown represent the typical shoe used by several different nations' cavalry farriers, as well as some corrective shoe designs. Reading the fine print in Boniface's book gives a new perspective on how, when, and if shoes were used on military horses of different nations, and echoes many of the discussions going on today for work and pleasure horses. In this series, Hoofcare + Lameness goes back 100 years to the golden age of cavalry. Through the transcribed words of US Cavalry Lieutenant Jonathan Boniface, we’ll see not only how cavalry horses were shod in different nations, but if they were shod. 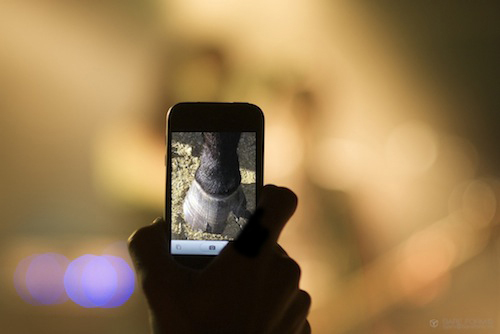 There's an elephant in the lecture hall and it's time we talked about it: If you pay to attend a conference, does your registration fee entitle you to record it? If so, should you share it with others? Is it okay to use your iPhone to take photos of a speaker's slides? How much leeway should be allowed for personal or educational use of conference content? We hear so much these days about emaciated, abandoned, undernourished and/or "unwanted" horses left to fend for themselves. 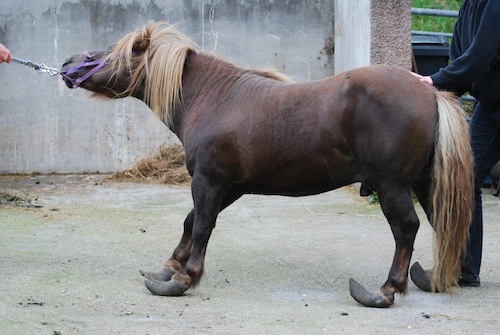 But today we have a video of a pony from the opposite end of the (weight) scale and the welfare scale. 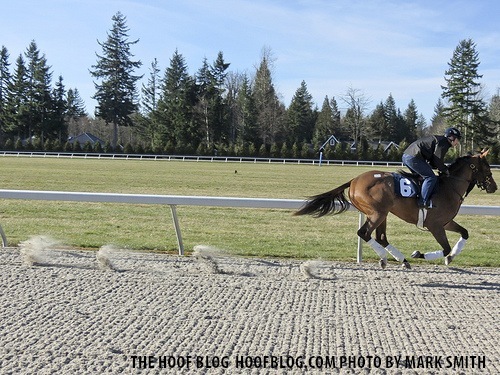 The racing surface known as "Polytrack" is one of several artificial surfaces that have been installed at racetracks in North America to improve safety and help cope with bad weather. But it also changes the way the hoof interacts with the surface. 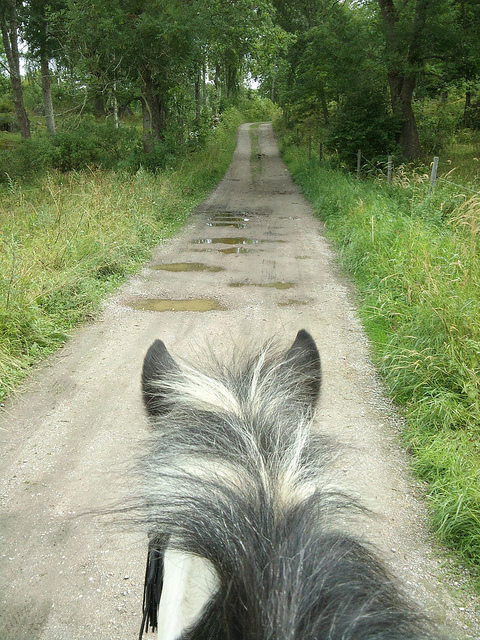 The characteristic slide that horses experience on dirt can be "sticky" for some horses. Experimenting with and without shoes during training and racing has led some trainers to try some unorthodox combinations of shoes--or no shoes at all. Update: A second "no shoes" designated horse won a race at Keeneland on Sunday, bringing the total of winners to two in three days. Updated information has been added at the end of this article. A Career on the Hoof: Does Geography Matter? If you're considering a career in hoofcare (or know someone who is), this video might be helpful to you. The requirements of the job, according to South African racetrack farrier Andy Rivas, are pretty much the same all over. How We Learn: Bracy Clark's Intricate "Model Hoof"
How can we know where we're going if we don't know where we have been? 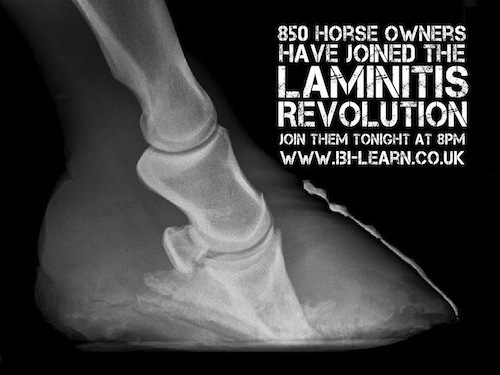 A much-anticipated webinar on endocrine laminitis is scheduled for Wednesday, April 10, at 8 pm London time, which is probably about 3 pm New York time. Were Ancient Horses' Fetlocks Less Susceptible to Breakdown Injury? As Saturday's 2013 Grand National approaches, the possibility of some news from the University of Liverpool's vet school has been high. Each year, injured racehorses find expert care at the nearby vet hospital, and the vet school is proud of its long association with the race and its role in helping prevent and treat injuries in racehorses. Does it take a university research study to prove that horses need exercise and diets? If spring weight gain isn't on horse owners' minds right now, it will be soon. Many horses now come through the winter in robust condition, thanks to modern feeds, warm barns, snuggly blankets and owners who don't ride often in winter...if ever.